We’ve posted before on iron-catalyzed reactions (see here for a recent post) as greener alternatives to more traditional platinum group catalyzed reactions. 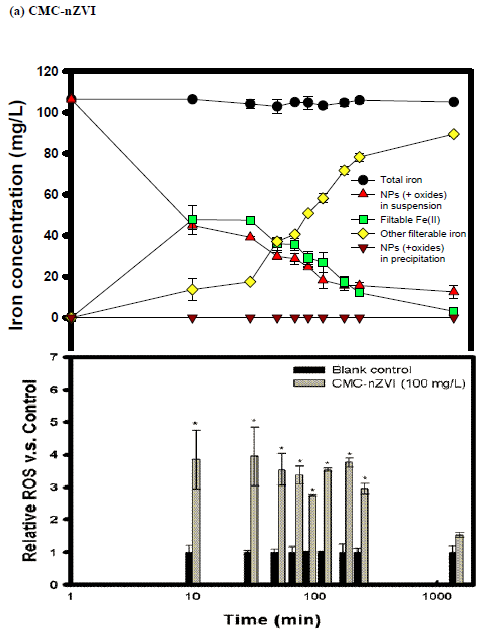 However, even iron has toxicity concerns as described in this paper from National Taiwan University on the toxicity in medaka fish of zerovalent iron (nZVI) nanoparticles (NPs). This is particularly pertinent research in light of the increased usage of iron(0) nanomaterials in remediation. The study investigates the effects of four different iron dosing ‘solutions’ on the molecular, cellular and organismal health of medaka larvae: (i) carboxymethylcellulose stabilized nZVI (CMC-nZVI), (ii) non-stabilized nZVI (nZVI), (iii) magnetite NPs (nFe3O4), and (iv) soluble Fe(II). They first characterize the dosing solutions. The sizes of their nanoparticles are 75 nm, 25-75 nm, and 27 nm for CMC-nZVI, nZVI, and nFe3O4 respectively. The zeta potentials were measured to show, not surprisingly, that the CMC-stabilized particles are much more stable to aggregation than the non-stabilized nZVI. Interestingly, of the four iron dosing solutions, CMC-nZVI has the most significant impact on the level of dissolved oxygen, decreasing it to zero where it remained for 12 hours. Furthermore, this aerobic oxidation of CMC-nZVI leads to a release of 45 mg/L of soluble Fe(II) in 10 min from an initial concentration of 100 mg/L CMC-nZVI as well as an increase in reactive oxygen species (ROS). In contrast, nZVI and nFe3O4 are 20 – 40 % aggregated within 10 min and release less than 20 mg/L of Fe(II) during this time. Only nZVI induces the production of ROS with nFe3O4 and soluble Fe(II) showing no increase in ROS relative to the control. The following figure details these findings for CMC-nZVI; analogous graphs are found in the supplementary information for the other solutions.